Posted on January 14, 2019 January 14, 2019 in Press Release. 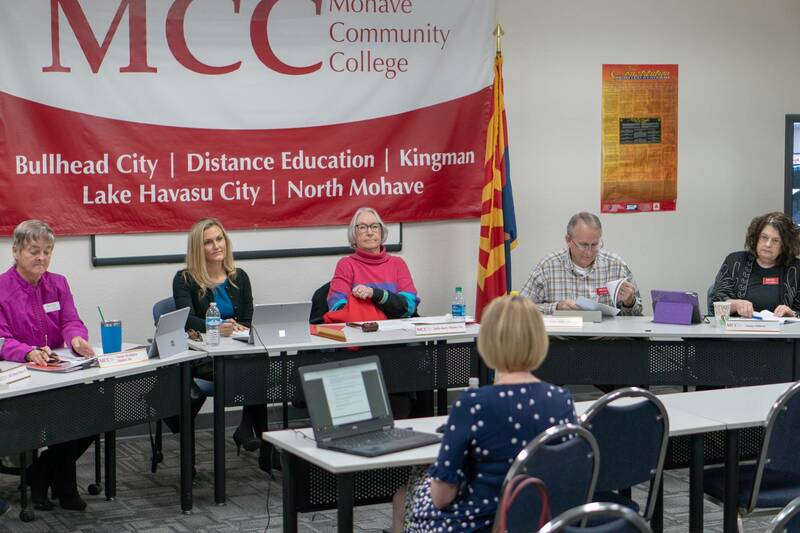 Mohave Community College is now under new leadership, as Dr. Michael Kearns made Friday, January 11, his final day as college president. Michael Kearns retired as president of MCC on January 11, 2019. He emailed college employees a day before to let them know that Friday would be his last day leading the college. A public announcement was made during the MCC Board of Governors meeting Friday morning. “Dr. Kearns did not want any fanfare or celebration, which is hard for me because of everything he has done for the college, “ said MCC Board President Julie Bare, who had tears in her eyes as she thanked Kearns for his leadership. Board Secretary Judy Selberg also thanked Dr. Kearns and noted he has been an ideal college president. Dr. Kearns did not say much during his final meeting as college president. He expects to remain in Kingman for a short time, and then move to Phoenix to be closer to his children. Diana Stithem, MCC Interim President. Interim President Diana Stithem will lead the college until a permanent replacement for Kearns is selected. She will assist with the transition and is not a candidate for the position of college president. So far, the college has received 29 applications from candidates across the country who would like to be the next MCC president. Board members receiving update on college president search from Jennie Dixon, MCC Chief Human Resources Officer. From left to right: Susan McAlpine, Ashley Pascual, Julie Bare, Vance Miller, Diana Stithem. The nationwide search will remain open until February 1, 2019. Board members plan to make a final decision on the position by May 2019. A complete timeline for the search process can be found at the college website www.mohave.edu/MCC-President-Search. Stithem retired as Vice President of MCC in December 2016. She started with the college in September 2003 as the dean of the distance education program. Prior to 2003 she was an attorney in Wyoming, where she worked in private practice and as a staff attorney for the Wyoming Supreme Court. She has a long history working in higher and adult education, which includes serving as the director of the state of Wyoming Adult Education program, as a supervisor and director of the University of Wyoming College of Law Legal Services Program, and as a visiting professor at the law school. While at MCC she was instrumental in developing and managing the college online education program, serving as the Dean of Extended (Online) Campus. Also at the Friday meeting, the board presented former member Phyllis Smith with an award for her six years of service to the college. Smith’s replacement, Ashley Pascual, was welcomed and sworn in as the newest member of the MCC governing board. Along with Pascual, Susan McAlpine took the oath of office. McAlpine was appointed to the board in 2018 to replace Jon Longoria after he retired from the board.